World renowned, Fairmont San Francisco presents an awe-inspiring picture of historic San Francisco. The grandeur of the luxury hotel atop Nob Hill coupled with its reputation for impeccable service promises a truly memorable experience. Central to the Financial District, Union Square and Fisherman's Wharf, the Fairmont Hotel is located at the only spot in San Francisco where each of the City's cable car lines meet. Located in the heart of San Francisco, atop the illustrious Nob Hill Neighborhood. It is located just 4 blocks from the shopping of Union Square and Maiden Lane, and 3 blocks from Financial Disctrict and Chinatown. Fairmont San Francisco hotel provides accommodations that are a testament to luxury with 591 individually furnished and decorated guest rooms. The 62 elegant suites offer impressive views of the City and Bay. 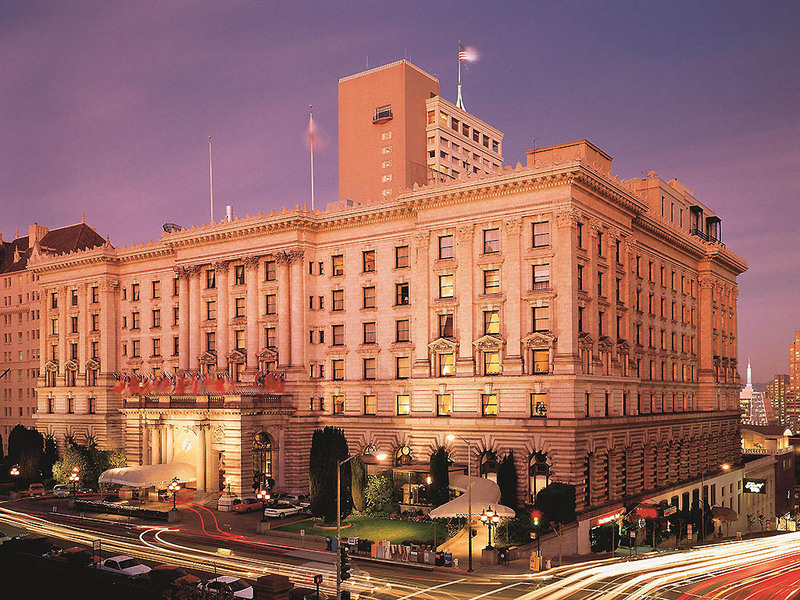 The Fairmont hotel in San Francisco, CA, is an ideal escape. Built in 1907- the hotel combines a classic ambiance with modern amenities. Laurel Court Restaurant in San Francisco showcases seasonal menus that are authentically local, traditional and innovative. The Culinary Team produces much of its charcuterie in-house, using traditional cold curing techniques. Laurel Court Restaurant & Bar was returned to its original grandeur and we are proud to offer traditional Afternoon Tea Service in the same style it was served 100 years ago. The grand tradition of impeccable service and delectable treats continues. Tonga Room in San Francisco offers a tropical and festive atmosphere with live entertainment, dancing and a rain storm. Tonga Room serves exceptional Pacific Rim Asian Cuisine in a tropical setting. Be sure to try the Mai Tai, the City's best! Inspired by the cafes of Europe, Caffé Cento combines the coffee of illy with the chocolate of Ghirardelli and the hospitality of Fairmont. In addition to specialty coffees, it also offers a selection of teas, pastries, and breakfast and lunch items. Daily beverage service available with a limited a la carte menu served daily from 11:30 a.m. to 10:00 p.m.
Fantastisk byggnad - men kanske behövs en update när det gäller vissa ting. Portern som tog emot oss (17.2 vid 18.00 tiden) gav ett fantastiskt trevligt intryck. Receptionshallen imponerande. En sänglampa trasig och för lite handdukar en dag. Bagateller, som egentligen inte betyder så mycket, men som å andra sidan inte skall ske... Kostnad för internet har definitivt &quot;gått ut på datum&quot;. Skall givetvis vara inkluderat i priset på alla hotell, och inte minst på ett hotell med Fairmonts standard.